I guess it all depends on where you think EJ would have realistically gotten taken if not for us. If that's the second then maybe, but if it's the third you're just screwing yourself twice, and if its the 4th . . . then the description might offend my delicate sensibilities. IIRC the compensation made it seem like we initiated the trade. There's a lot of quarterbacks we didn't draft, and its hard to believe EJ didn't play a role in that. For me its gotta be EJ. You never know what's going to happen, but you know when you overreach. The only correlation wonderlic has to NFL success is for cbs and its negative. I guess Miami is so bad this year that they give you two wins when you beat them. I believe you but I thought he performed better than expected after year 1, if someone wanted to trade for him at that point I would think it would cost more than a first. Which is why we got him for a third. Things could have gone differently, they didn't. There was a point in KBs career he probably could have brought in two firsts or at least a 1st and 2nd. I'm sure if I look back you'll be on record with that opinion at the time. General consensus was that it was a great pickup at the time. Even if it wasn't how bad of a trade was it? 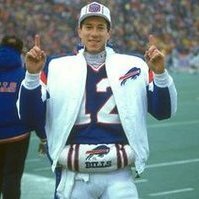 At the time we had a serious issue at WR and a starting QB (Peterman) who would have excelled with accurate balls to a big target. What would a fair price be? Are you saying Beene shouldn't have been looking? If people are seriously criticizing this trade it can only be because it happened to not work out or they have some ax to grind. No one is saying that he's omniscient. Good GMs take smart calculated risks, especially when your team has a glaring need. At the time he was signed he was suppose to be a number 1 receiver, the fact that he wasn't hasn't set the team back at all. Next you'll be criticizing him for every third round pick that didn't pan out? Best player available is like anything else that's good for you but may be a little unpleasant to swallow at the time. Like eating your vegetables or taking time to get a little more exercise. BPA is obviously the best strategy, it's just not emotionally easy to do it. I always pick the most optimal strategy when someone else has to do the hard part and I get to stay at home and complain about their blunders. Lets not forget long snapper. Letting Garrison Sanborn leave town for Tampa was one of the great mistakes of this regime. There's just no excuse for letting a proven 7 year starter get away is just inexcusable. I mean when other players ***** up it's almost never worse than a change of possession but when you're long snapper ***** up that's 7 points for the other team. I say we draft a punter in the first every year until we finally land our franchise punter.